I’ve been on a soup kick this January and I don’t see this trend ending anytime soon. I’m particularly fond of hearty stews that are more of a “clean out the fridge/pantry” kind of situation. This recipe fits the bill and we’re really happy with how this turned out. Smokey, spicy, nourishing and a breeze to prepare this stew is perfect for a busy weeknight when you’re too tired to prepare something more involved. In this recipe I let the spicy flavors of the chorizo infuse the oil I cooked the vegetables in. It’s important to use Spanish chorizo (it’s already cured and fully cooked) and let those deep flavors work their magic! If you’re craving comfort this is the recipe for you. 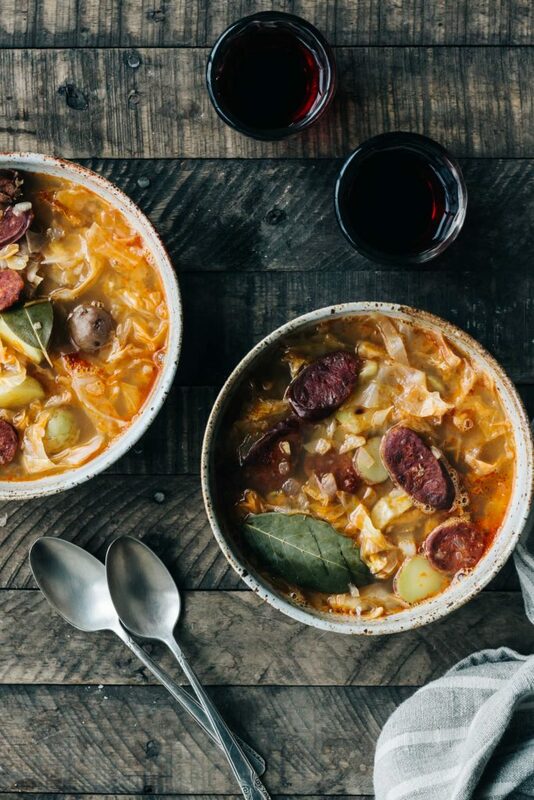 We served our stew with a few glasses of red wine and sat by the wood stove for the ultimate cozy date night at home. Heat the oil in a large pot over medium heat. Add the onion and garlic and cook, stirring occasionally, until fragrant, about 5 minutes. Add the chorizo, red pepper flakes and bay leaves and cook, stirring occasionally, until the chorizo colors the onion/garlic mixture, about 5 minutes longer. Add the potatoes and cook for 3 minutes longer. Toss in the cabbage and a hefty pinch of salt and pepper. Pour in 6 cups of broth or water and bring to a boil. Reduce heat and simmer until the potatoes are tender, but not mushy. About 20 minutes. Add more liquid, 1/2 cup at a time if soup is too thick. Season to taste with additional salt and pepper and serve warm. Just made this last night with Spanish chorizo and local Bend cabbage. It was tres delicious. So I am cooking the sausage first before throwing it in the pot, correct? yes, you’re adding the sausage to the pot to flavor the ingredients and cook with everything so that it’s pungent with the spicy chorizo flavor. I hope that makes sense!